World Hyundai Blog and Newsletter Great news and information about World Hyundai Matteson and Hyundai USA. Check back often for great Chicago Hyundai updates! Hopefully you had the chance to catch the 2016 Chicago Auto Show while it was in town! Now through the end of February, take advantage of Auto Show rebates on new 2015/2016 Sonata models in stock! Get an additional $500 auto show rebate and combine that with other current rebates for one of the best prices on a new Hyundai Sonata! Joey is a blogger, social media representative, photographer, and videographer for World Hyundai Matteson! View Joey's Google Profile. 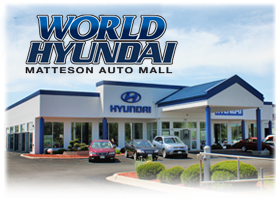 News and information about World Hyundai Matteson and Hyundai USA. Check back for Chicago Hyundai updates! Welcome to the World Hyundai Blog & Newsletter. Here you'll find all of the latest news and information regarding Hyundai as well as special offers and discount coupons. We'd like to think of this as your home for everything! "The right people make all the difference in the world." View New & Used Vehicles! The World Hyundai Social Network! Copyright World Hyundai Blog and Newsletter. All Rights Reserved.